You’ve heard of the everything bagel, Professional Learning Board presents the everything PD course package, The Everything Self-Study Package, which includes the following THIRTY self-study courses adding up to 150 hours of professional development. 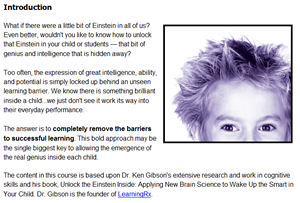 Scroll down to see more information on the courses in this package. Teaching each and every student effectively is never easy. It is next to impossible to find a classroom full of students with the same needs, learning levels and abilities. Teachers are faced with the challenge of teaching a diverse group the same lesson and ensuring that they all learn in the process. It can be easy to settle for teaching some, or even most of the students, while leaving out a portion of the class in the process. 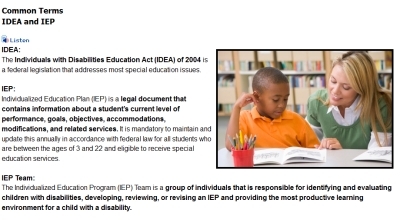 This course is designed to present teachers with the Universal Design of Learning (UDL) framework, which makes teaching ALL students a very real possibility. The framework builds on research findings that show how a single teaching approach has very limited results on student learning, highlighting the need for a new curricular approach. Here a learner’s level of recognition, strategic, and affective networks are all taken into account to determine the best way to teach them. The course is centered around exploring practical strategies that can be used to add a much needed element of flexibility in teaching presentation, student expression and meaningful engagement and upholding learning as the primary focus. Integrate Ruben Puentedura’s SAMR model with Alan November’s work on Transformative Learning to find the best apps to educate YOUR students. The integration of apps into education, may seem like a natural product of the times. However, successfully impacting students’ learning, requires a whole new level of teachers’ engagement and effort. Teachers will be equipped to go beyond using an app merely because someone else has recommended it and fully examine the true learning potential. To this end, teachers must take into account specifics, including logistics, ability to manage, content access, sound and image quality, all while evaluating individual apps. A comprehensive App Evaluation Framework, specially designed for the classroom context is presented for teachers’ critical consideration of educational apps before deciding to introduce them to students. 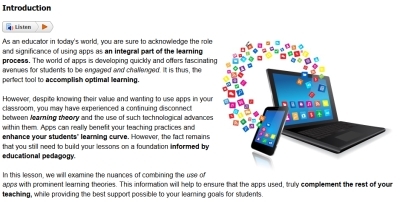 With an integrated approach, teachers can successfully consider an apps’ connections with curriculum content and ability to amplify existing learning levels, while evaluating systematically their transformative learning capability. 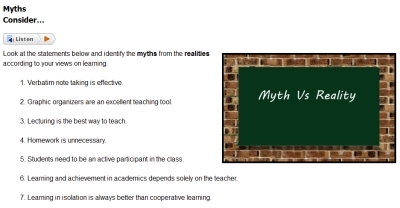 Implement collaborative learning in classrooms and develop successful learners. 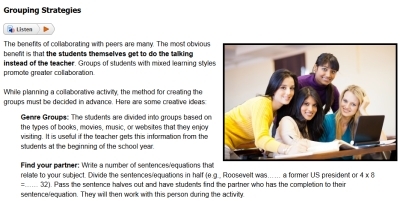 This framework enables teachers to recognize characteristics of collaborative classrooms, be aware of student and teacher roles, and practice group activities as an essential part of the classroom. Teachers are introduced to school-wide policy reforms in place today that promote collaboration and group activities. 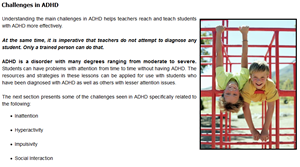 Teachers are also provided with ideas and strategies to accommodate learners, including students with special needs. The practical examples, real-life experiences, and templates in this online course provide teachers a structure to use in their own classrooms. 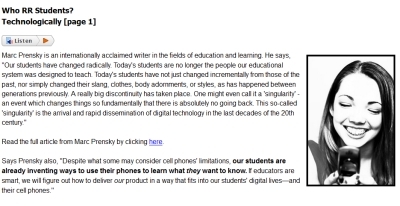 21st century students must have more than just textbook knowledge. Evaluating student learning goes beyond merely grading papers. 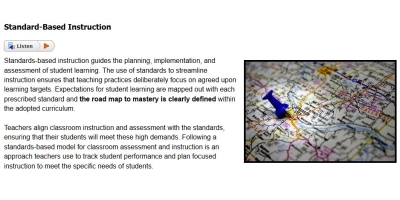 Both schools and teachers need to intentionally move toward assessing students’ understanding, and then use this insight to enhance teaching and learning practices. 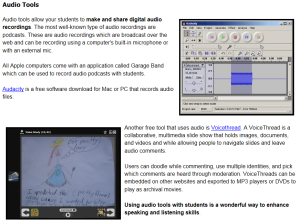 The wealth of resources and classroom examples provided here enable teachers to enhance existing evaluation practices. 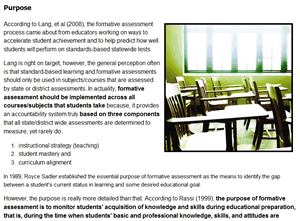 Calling for a shift in approach, the course lays out effective and dynamic methods by which teachers can assess student work. These help ensure that educational focus remains entirely on both teacher and student development. 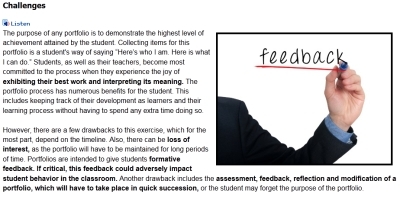 The course recommends expanding these best practices by “Examining Student Work” through a process of intentional reflection with other teachers. Through encouragement to engage with other teachers and learn from shared insights, teachers are equipped with useful resources to successfully implement this process. Brian Creasman became principal of a “low performing” high school and was confronted with these two questions. A high school classified as “low performing” obviously is not a title any teacher, administrator, student or parent wants for their school. A person with autism experiences the world in a different way. They think and remember events differently. They react and communicate differently. By understanding the how and why of these differences, you can become one who gains insight. Understanding some of the different issues people with autism must face can help us to be more understanding and improve our interactions. By understanding how students with autism function, we can make more informed choices in education and care and, maybe most importantly, we can assess our own automatic hard-wired responses that might occur when someone is truly different. 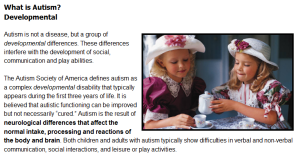 By understanding the underlying components of developmental differences in those on the spectrum, teachers, parents and others can reframe their own preconceived expectations and help support the learning and behavior for those with autism. Learn to more clearly understand the world from the perspective of someone with autism. Project management encompasses a range of skills that are highly prized in the world today and include – research, collaboration, communication, leadership, problem-solving and cooperation. For the education system to truly fulfill its purpose of preparing students for a world that requires a mastery of such skills, teachers must be able to find ways to integrate project management training into their classrooms without disrupting the curricular learning. Keeping in view the challenges this poses, teachers are presented with project-based learning, as a means to successfully develop students’ needed skills, while simultaneously keeping the focus on topics within the curriculum. The integration of projects into classroom teaching is based on the finding that, often the best way students learn is by doing. Teachers are provided with a range of examples and strategies, along with an in-depth view into the effective use of projects, and understanding of how they can influence student growth at every stage. STEM integration doesn’t need a huge budget, lots of technology, or a ready-to-use curriculum. It’s something any teacher, any school and any classroom can integrate. This course teachers you how. We understand that no one knows your students better than you. Therefore, this course is designed to equip and encourage you to integrate STEM education into your classrooms in ways that you think are most suitable for your students. You will learn how to plan your classroom set-up keeping in mind the needs of your students. You will also become confident to design your own STEM curriculum, while integrating the standards, including the Common Core Standards. STEM education is not just about doing what’s “cool” and “in.” It is essential in today’s world that our students learn to apply what they learn in real life situations and across different subjects. 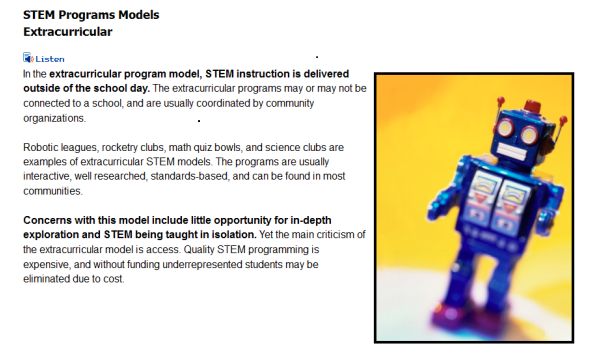 The STEM model helps prepare our students for the 21st century. Successfully integrate portfolios to enhance students’ development and become an essential part of teaching and learning. Through the resources in this course, teachers are equipped to understand and use portfolios to emphasize the student’s role of taking responsibility for their learning and the teacher’s role of guiding that learning. The practical tips and suggestions provided in this course will take teachers through the process of implementing portfolios in their classrooms, with factual information clearly linking student learning to the actual goal. Teachers will be introduced to the concept of using portfolios as assessment tools, and the advantages of their implementation to both teachers and students. 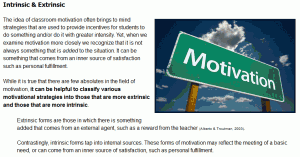 The resources included show teachers how to capitalize on the students natural tendency to save work, get them to take a second look and critically analyze how they can improve future work. Questions answered in this course include – How do teachers take on the role of ‘portfolio advisors’, and guide students through the process of creating and maintain portfolios? What is the relevance of a portfolio? What are the objectives of an effective portfolio? Rich in examples, considerations, suggestions and tips for teachers, this course aims to enhance the teaching and learning experience for students. With teen suicides on the rise, suicide prevention is an important issue and teacher awareness is crucial. This course helps teachers understand suicide and how it can be prevented. Teachers will learn to identify early signs of suicide ideations and will be equipped with basic tools to help students. Teachers will be introduced creative activities and strategies that can help promote safe classroom environments. The course also equips teachers to work together with the school to initiate and implement schoolwide policies and programs on suicide prevention. It is the wish of every committed teacher to help his or her students connect knowledge gained in the classroom with real life situations and process information in a way that takes them beyond the books. Teachers are constantly required to grab the attention of their students, keep them motivated and inspire them to own their learning. A well-planned field trip can serve all of these purposes in a unique way. Despite being known to be of great merit, schools across the country have been cutting short on such expeditions because of limited resources, whether financial constraints, personnel or time. 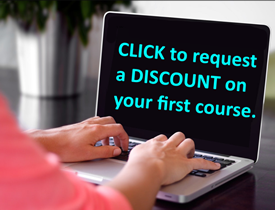 This course offers a great alternative to teachers and encourages them to make the most of one of the most widely-available resources of our times – technology. Given the rapidly developing digital resources, teachers can take a diverse group of students on virtual field trips and offer them near-life-like experiences that will develop their thoughts and provide wholesome educational opportunities. This course gives teachers a basic understanding of what virtual field trips are, the different types of trips and why they can be considered a valid alternative to actual field trips. It also offers a look at some concerns that surface while planning virtual field trips and how these can be addressed. The course also details the process of planning an effective virtual field trip with emphasis on how teachers can equip themselves technically. Looking at a selection of pre-existing virtual field trips, teachers will be able to understand the elements of a good trip. They will also learn how to create their own custom-made field trips using an array of online resources offered in the course. Classroom examples will help teachers understand how they can incorporate these virtual trips in their lesson plans and the various roles they will play during these tours. Teachers will also be equipped to evaluate virtual field trips and will know their impact on student learning. No Reviews of “PACKAGE: The Everything Package (150 Hours)” yet.